While Catalina’s older-generation designs have offered up plenty of great miles over the years, the 275 Sport is poised to provide an even higher level of performance than its predecessors. It also weighs in at a price point that designer Gerry Douglas feels will be attractive not just to younger couples, but also to more experienced sailors looking to downsize from a larger cruiser. Available with either a deep or shoal-draft keel, the Catalina’s nearly plumb bow, low-profile cabintrunk and tiller steering ensure excellent performance, while a spacious cockpit with generously proportioned benches and ergonomically sculpted coamings provides plenty of room for friends and family to enjoy a comfortable ride. 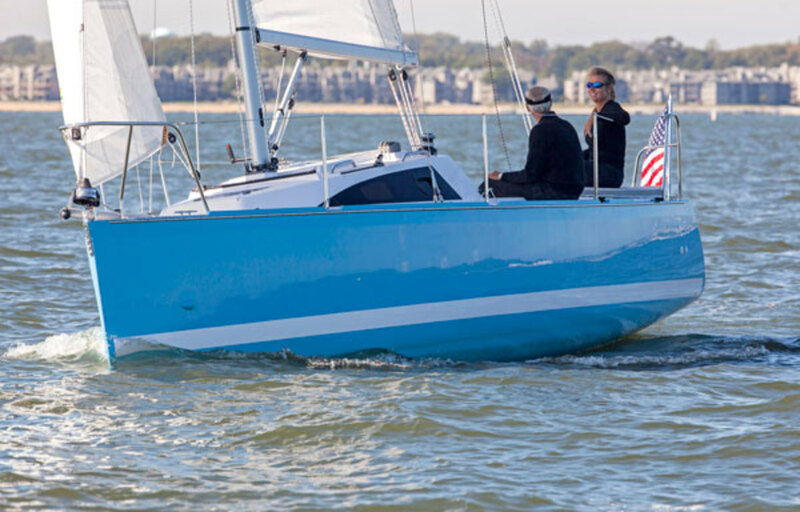 The 275 is also configured for easy shorthanded work, with running rigging led aft and a self-tacking roller-furling jib. For those in search of additional performance with an eye toward mixing things up out on the racecourse, there is the option of a retractable sprit for flying an A-sail, jib tracks for sheeting in a larger 110 percent headsail and an additional coach house winch. Clean sight lines and elevated helm seating make driving the boat fun at any angle of sail. Belowdecks, the 275 includes a quarterberth that is sized to moonlight as an SUP/surfboard garage and a settee table that lowers to create a large, comfortable centerline berth. An optional one-burner stove and a slide-out cooler comprise the galley, while an enclosed head civilizes weekend escapes and translucent hatches admit a wealth of ambient light. In an interesting touch, the backs for the settees double as removable sea bags, making it that much easier to pack up and stow your gear before and after sailing. All in all, this is a smart, fun, well-conceived boat that represents an exciting new departure for the Catalina brand and is well worth checking out.